As any visitor here will know, the sharing of food is one of the great joys of my life – but I don’t think we’ve ever really talked about the whys and wherefores of actually sharing recipes and ideas for dishes. It seems self-evident that folks who read – and write – cookery blogs have a natural, internalised desire to share knowledge and ideas about cooking, so it has always stunned me when people talk about having “secret” recipes. Whatever the truth of Slater’s step-mum’s kitchen caper might have been, his portrayal of her represents a figure some people know well. I wonder if this kind of woman – always a woman in the stories I’ve heard – is still around, or is she only a figure of bygone eras, when a woman’s power in society was so limited that she felt she had to wield it in this manner? Or am I inventing this Fifties Femme? The holding of recipe cards close to the chest in this way speaks of all kinds of things that have, obviously, nothing to do with the biscuit. It implies that cooking is a contest, that the only value in making beautiful food for others is in your power to impress them, and indeed that one’s esteem in the eyes of others is so fragile that refusal to share something as trivial as a recipe will actually help maintain that esteem. When of course it just does the opposite – paints you as desperate rather than skilled, mean-spirited rather than generous. In fact the whole concept of generosity is completely absent in this kind of syndrome. As well, when all recipes spring from other recipes, it seems somehow dishonourable to suggest that my recipe alone is original, and therefore so much more valuable than yours. It also smacks of a lack of confidence about the bounty of creativity – this recipe is so precious because there will never be others to take its place. I’ve known writers like this in my time, who obsessively, vigilantly – and in vain – inspect the work of others for similarities to theirs. What such people seem not to understand is that this fearful obsessing over other people’s wells of creativity means that their own will always be in danger of drying up completely. Anyhoo, I’m happy to say that among my friends and family, recipes and food ideas fly back and forth and round and about with complete abandon. Take the unbelievably good lemon curd fool we ate at the Empress’s palace last week, which I then immediately pinched for our dinner guests on Saturday night. It’s one of the easiest, quickest and yet most swooningly striking desserts you’ll ever try. Bizarrely, I had never made lemon curd until that day but now I know how easy and how very fine it is – my favourite meld of citrussy tartness and sweetness – I’m going to find many other desserty avenues for it. Which brings me to another part of the pleasure of sharing recipes; one leads to another, which then morphs into another which gives birth to another and another, in a rich cycle of generosity, abundance and plenty. And as soon as I “invent” – or am given! – a suitably delicious new incarnation of this luxurious dessert I’m inviting the Empress over to eat it. Make a lemon curd – I used the recipe in Stephanie Alexander’s The Cook’s Companion, but there are thousands about – and let it cool, then chill (I made ours the day before). Whip some cream into stiff peaks – from memory I used 300ml pouring cream for a curd of 1.5 times Stephanie’s quantity. Mix the two together – that’s it! Simplicity itself. We served ours in small glasses with a sploosh of passionfruit pulp on top of each one. The Empress had a wafer of home-made biscotti sticking out of hers. I can imagine all kinds of lovely toppings and additions – crumbled pistachios maybe, or a little finely chopped mint? Love to hear your tales of recipes shared or protected. Do people still refuse to share recipes? Or, as women have actually begun to take part in the world beyond the kitchen, has such desperate recipe-protection become a thing of the past? And I wonder if the syndrome has arisen among men as they begin to take up more space in the kitchen? Or am I looking at this whole thing from the wrong point of view? Is there any virtue in keeping “secret recipes” that I’m overlooking? Gin + tonic + cake: what’s not to love? So in my last year as judge, it was a tricky task. I was aided by the fact that some of the most dedicated contenders were out of the country or not competing this year for other reasons, so my task was slightly easier. But that still made fifteen tiny pieces of cake, biscuit and savoury tart I had to eat! The winner this year, by a hair’s breadth, was Kate Justelius-Wright with this gorgeous and original Gin & Tonic Cake. As you will know, I have more a salty-fat-tooth than a sweet one, so this was a very subjective judgement (which may prompt A&U competitors to quite reasonably ask what the hell I was doing there anyway!) – but this cake is exactly my cup of tea: a thick syrupy slab of citrussy goodness. It is not too sweet, has the deliciously bitter & chewy shred of lemon on top – and let’s face it, any cake with gin in it cannot be a bad thing. Kate has kindly supplied the recipe*, which comes from Julie Le Clerk’s Favourite Cakes. Judging by the deliciousness of this one, you sweet-toothed cake lovers might want this baby on your Christmas lists … I plan to give this a shot quite soon, possibly employing the one-for-the-cake, one-for-the-cook G&T methodology. The photo here is of Kate’s cake. I think you should all go make it and report back to us here. And for my next post I shall be returning to my spiritual home in the savoury world. * Note, added May 4 2012: I’m afraid I have been feeling a bit worried about this post, given that the recipe is not mine or Kate’s, and I’m not sure whether the reproduction I had here is word for word or an adaptation. So, to be on the safe side of courtesy and ethics I’m removing it and suggesting that you buy or borrow Julie’s book for the original. Sorry to disappoint those hoping for the recipe. The book looks wonderful though so I am sure it will be worth the cover price! The last entirely vegetarian dinner party I cooked was a wintry little number, but very satisfying, with a few nicely contrasting elements I think. The mainstay was a mushroom ragu served on creamy polenta, paired with a side dish of a punchy green salad with lentils & goat’s cheese. There are a couple of things that made this work well. First, both the ragu and the lentils used the roasted vegetable stock, as I described ages ago here. This time though, I took a leaf out of Skye Gyngell’s book – her secret flavour weapons often include tamari sauce and maple syrup, so I added a tablespoon of each to the reduced stock. I swear this little combo, while not leaping out as separate flavours, really gives a layered depth and complexity to the stock. Next was the assortment of mushrooms. I used about 600g of combined chopped Portobello, field and Swiss brown mushrooms, and later added – importantly – a good tablespoon’s worth of dried porcinis to the mix. Again, this gives a big hit of rich flavour. Heat oil & add celery, carrot, onion, garlic and some sea salt, sauté until soft. Add a good big knob of butter & a little more oil, turn up the heat and – gradually, in batches – sauté the fresh mushrooms with the mirepoix over a high heat until the mushrooms lose most of their moisture and are nicely browned. Add wine, tomatoes, stock and herbs and bring to the boil, then turn down to a simmer. Add the chopped porcini and liquid to the sauce. Stir, then simmer uncovered for around 30 minutes (or even up to an hour), till the sauce has reduced and thickened, adding another good slug of oil if it looks too watery. Add stock or water if at any stage it becomes too thick. Not long before you’re ready to serve, make the creamy polenta – this is dead simple, as described here, but does take a little time. Just do the onion & milk bit ahead of time, and if you need to, have your guests chat with you in the kitchen while you stir. Spoon the polenta into shallow pasta bowls, and top with a heap of the mushroom ragu (add a tiny swizzle of olive oil at the last second, if you dare), and sprinkle with Parmesan at the table. This zingy little salad can be made completely ahead of time and simply dressed & tossed just before you eat. 1. Sling half a cup of puy lentils into a pan of hot vegetable stock, and simmer for 20 minutes or till tender. Drain and return to the pan with a splash of olive oil till ready to assemble the salad. 2. Have some slow-roasted tomatoes (scroll down on the Essential Ingredients page) ready to go. 3. When you’re ready to serve, toss some good green salad leaves (specially good with some texturally springy ones, like curly endive and radicchio as well as soft lettuce) together with the scattered lentils and tomatoes in a bowl with a dressing of three-parts good extra-virgin oil to one-part best-quality balsamic vinegar. Then tear up some marinated goat’s cheese (or even better, your homemade labneh!) and toss it into the salad in chunks. Serve in a bowl at the table. For dessert, I can’t recommend this whole orange cake highly enough – and because it’s made with almond meal instead of flour, it gives your guests another dose of good nutty protein. Serve it with some more yoghurt or cream on the side. Another almondy option is a frangipane tart, and although I haven’t made this particular one, there is a beautiful-sounding recipe here. Otherwise, I’d go for some other fruit-based dessert. So there you have it – a simple but I think nicely varied vegetarian dinner menu for four, with heaps of punchy flavour and texture, and also providing a reasonably diverse mix of protein, dairy, carbohydrate and lots of other goodies. I would love to hear comment from our vegetarian visitors about how this combination might be improved – and as well, keep your ideas for zingy vego dinner party dishes coming. Till now, my appreciation of Vitis vinifera has been limited to a lifelong (and let’s admit it, rather passionate) love affair with the grape. I’ve admired the leaves from afar – on the plant – but cooking with them has never appealed. I know everybody loves dolmades, for example, but their vineleaf wrapping has always been way too slimy for my liking. Frankly I’ve found eating dolmades too often to feel like popping a big fat slug in the mouth. 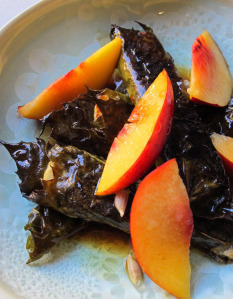 So the idea of using those vine leaves packed in oil – ugh. But joy of joys, these reservations are in the past, because this week I have discovered the joy of cooking with fresh vine leaves, and there ain’t no turning back. I love them. And now I’m plotting to somehow grow a vine here, for our own supply. This new affair began when Mr & Ms Melba offered me some leaves from their gorgeously lush and laden vine, and mentioned a turkish vine leaf ‘pie’ Ms M had made. I had to check that out. And then the stars aligned, with Karen Martini’s incredible looking vine leaf recipes in last week’s Sun Herald. Both these dishes are the business. I urge you to pluck a big handful of leaves next time you are in the vicinity of a vine, and try them. One other great thing about the leaves is, as I discovered by leaving a sealed plastic bag full of them in the fridge and then forgetting them for a whole two weeks, that they keep incredibly well. When I opened the bag it was as if they were picked minutes before. Amazing. This post I’ll share the Karen Martini recipe, which I now understand is a variation on a traditional Greek dish (JMo, if you’re out there, can you confirm? ), but was a revelation to me. Next time, the pie. Now the recipe below used packaged vine leaves, but was perfect with fresh. The only preparation I did was soak the leaves in boiling water for 10 minutes, then drain and press dry in a tea towel, and cut out the hard stalk. We used nectarines in place of peach and it was delicious. Having never heard of saba, I used vin cotto as suggested. Di-vine. 1. Cut the top off the garlic bulb, drizzle with oil, wrap in foil and roast in a moderate oven for 40 minutes or till soft. Allow to cool. 2. Smear each haloumi slice with the roasted garlic, then wrap tightly in a vine leaf. 3. Heat 80ml olive oil in a non-stick frying pan over medium heat and cook haloumi for 1 minute each side, till the cheese starts to melt, but not burning the leaf. 4. Arrange on a plate, scatter with the nectarine or peach and drizzle with the lemon juice and vin cotto / saba . About mid January each year I start stalking the grocery shelves for figs. I’m not sure what it is about figs that just gets my blood fizzling – the textural feast, perhaps? The soft, creamy interior with that slightly powdery skin? Or maybe it’s just that I pretty much always eat them with prosciutto, and that ol sweet/salty flavour bomb is simply irresistible. And then there’s the absence-makes-the-heart-grow-fonder factor; with such a relatively short season, their arrival is cause for celebration and one is simply obliged to make a fig festival of the fact each year. On Saturday I saw the first display in our grocer’s – of local figs that is, not Californians which have been there for a while, priced at something like four bucks each – and so of course I pounced on a big punnet of squat, heavy little beauties. That evening, before we had a chance to eat them, we went to dinner at our friends Mr & Ms Lilyfields’, and were served a fig salad so delicious that I was compelled to try to replicate it immediately the next day. Ms Lilyfield used the classic combo of prosciutto, soft cheese & figs (I’ve used gorgonzola and other blue cheeses before – and oh, my it’s good) but she chose that amazing Persian feta, to which she added the lovely, slightly bitter, sharpness of radicchio. The finishing touch was a drizzle of luscious caramelised balsamic vinegar. As I say, we loved it so much we tried a similar thing ourselves the next evening, and it was fantastic. So here’s my made-up copycat version. You gotta be careful not to overdo the sweetness in this, specially with the dressing. You can buy caramelised balsamic (I was given some of this last year and it is gorgeous stuff), but it’s also very simple to make. Oh and I reckon this salad would be incredible with labneh too; that’s my next plan. Cut figs into halves or quarters and brush with a teeny bit of olive oil. Grill these on a tray with the prosciutto for a few minutes until the figs are warmed & the prosciutto crisp. Meanwhile, simmer the balsamic vinegar and sugar in the smallest pan you have, and gently reduce it till it’s thick and syrupy. Arrange the radicchio leaves in a bowl (or, more glamorously, on separate plates for each person) and drizzle with good olive oil. Top with the figs, prosciutto and add as much feta as you like – about three tablespoons is probably plenty. Gently mix these and the leaves together with your hands, add the basil and drizzle the lot with the balsamic syrup and season. Stand by for groans of delight. Of course there are lots of other things to do with figs, including just popping one in your mouth for the pleasure explosion – I’m keen to hear your faves. Any fig festival contributions to share? Inspired by Fiona’s comment about Indian food yesterday, plus the fact we had been given two kilos of beautiful Killcare cumquats by our friends the Nannas of Naremburn, I messed around with a few chutney recipes and came up with this spicy Indian-style cumquat chutney. I began with the recipe for spiced kumquat chutney here, and then made a few variations based on what I had in the cupboards, and by flipping back and forth through Stephanie Alexander’s orange book to check out her pickled cumquat, her mango chutney (p733) and her peach chutney (p519). The original recipe called for currants; I had only a handful of currants in the larder but lots of barberries, the tart little rubies I found on our Persian excursion the other week, so I threw them in instead, which doubtless bumped up the sour/tart factor. I also threw in some cardamom pods, cinnamon, whole cloves and star anise. Anyhoo, if you’re game and have heaps of ready cumquats on your conscience, try it out. I take no responsibility for the outcome, though! Throw everything but the lime juice into a heavy-based saucepan, reserving a little of the sugar and salt until you taste it at the end. Stir over heat until sugar has dissolved and chutney has come to boiling point. Boil steadily for an hour or so, until the chutney reduces and becomes thick. Adjust seasoning with sugar and salt, then bottle into sterilised jars. This quantity made eight small to medium jars of chutney.